Cast: Luís Marín, Oscar Cruz, Manuel Zarzo, Juanjo Losada, Ramón Rubio, Rafael Vargas, María Mayer. Synopsis: A gang of juvenile delinquents pool their resources to pay for one of their number to be put on the bill of a bull-fighting contest. So, almost seven months after my last post on the matter, the Carlos Saura Challenge restarts! And I've gone all the way back to the beginning to Saura's directorial debut. When I started the Challenge, in February last year, Los golfos had long been unavailable in any kind of home viewing / VOD format - in fact, I don't think there has ever been a Spanish DVD release of the film - so I kicked off the Challenge with his second film instead. But towards the end of the year, while perusing those 'Best Films/DVDs/Scenes of the Year'-type articles that proliferate in December, I discovered that a DVD of the film had been released in France in the summer (although only with French subtitles). The review bemoaned the quality of the print used for the DVD (as the stills in this post can attest) - and the Spanish Establishment's general lack of interest in film preservation or restoration (although producer Enrique Cerezo has taken matters into his own hands on that front) - but concluded by saying that to have the film available in any form is a good thing and in the circumstances would have to suffice. 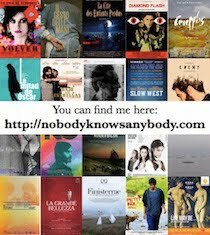 I tracked down a copy of the DVD (which features an interview with Pere Portabella, who produced the film, so my different projects briefly connect!) but didn't rush to watch it - watching a Spanish film with French subtitles is only marginally better than watching a French film with Spanish subtitles, and both give me a headache. Then I spotted that it was going to screen in Manchester as part of Viva, and I knew that I'd have to go and see it on the big screen (with English subtitles - the first film I've watched so far in this Challenge to have them!). You can read my review of the film for Eye for Film here. As I mention in there, the quality of the print was poor, but I'm glad I saw it in that format as it's likely that I'll be viewing the rest of his films on a variety of small screens. I don't want to replicate what I said in my review, so I'm just going to expand on a couple of points for this post. Like Llanto por un bandido, Los golfos suffered at the hands of the censors, although unlike the later film (which jumps so abruptly in the Buñuel-starring opening sequence that I thought the DVD had skipped) the excised footage appears to have been reinstated in the version that I saw. At the time, productions had to go through 'prior censorship', the submission of their script before they could start shooting, and because the censors were not production specialists they usually focussed on the narrative form. 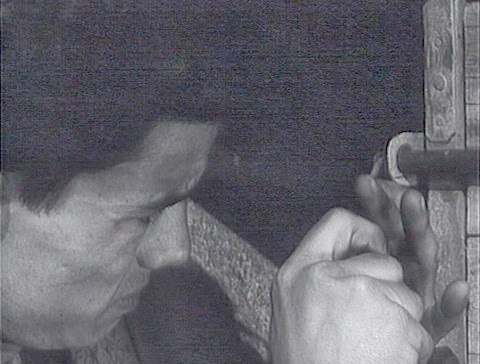 Saura's filmmaking to date had been in documentary, and he was not overly interested in questions of narrative, but Marvin D'Lugo suggests that the director's experience of going through four major rewrites for Los golfos gave him 'a deeper understanding of the ideological function of narrative as perceived in the censors' minds' (1991: 33). I think this put him in good stead later on where, as discussed in earlier posts, the narratives become more opaque and metaphorical - meaning that the censors had less to fixate on, or less that they could concretely point to for removal. But even here some of the editing choices lead to abrupt cuts that would seem to have been deliberate on Saura's part, to disrupt the 'normal' narrative form, rather than due to external tampering. The other aspect that I want to highlight is the stylishness of some of the robberies - there is a slickness to them that is difficult to connect to the other Saura films I've seen to date. That said, the robbery in a truck stop parking lot reminded me of certain sections of La caza - something to do with the lighting (that blazing sun that burns with a white heat almost comes through the screen) but also the combination of sharp timing and economic movement. Although Carlos Saura didn't work with Elías Querejeta and his 'house team', including acclaimed editor Pablo G. del Amo, until La caza, there is a kernel of something here that would blossom in that film - the perception I've come across in my reading is that Saura managed to create a masterpiece with La caza because he started working with Querejeta and Co. at that point, but the flashes of brilliance in Los golfos suggest that there was already something forming. 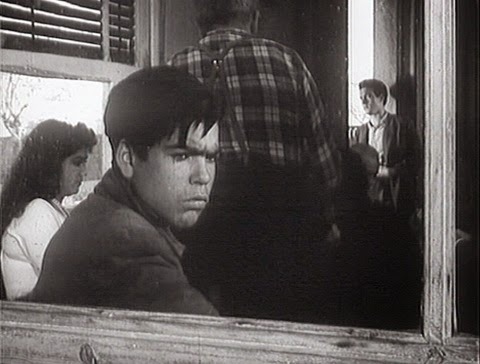 In front of frame, Chato (Juanjo Losada) waits to give the signal to those outside, while Julian (Manuel Zarzo) is on lookout in the rear of frame. The truck driver is sitting at the table behind Chato. 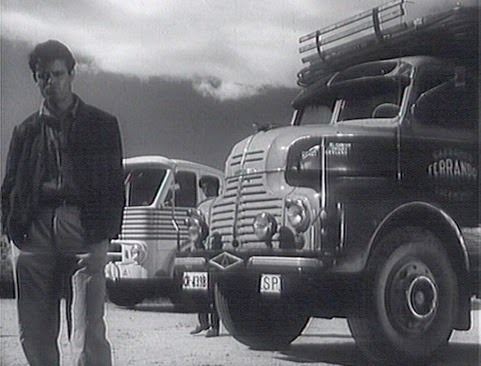 Paco (Ramón Rubio) who proceeds to break into the truck. 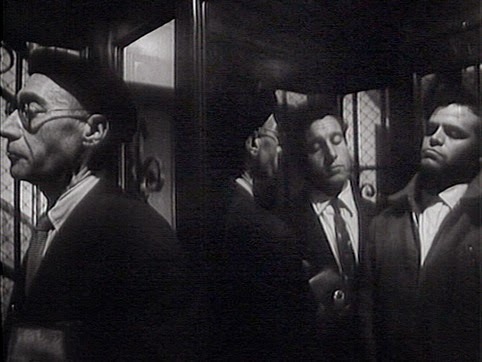 Saura rapidly cuts between close-ups of each of the men, ramping up the tension.